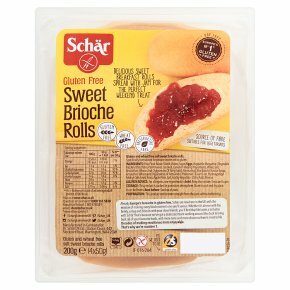 Gluten and wheat free soft sweet brioche rolls. Delicious sweet breakfast rolls spread with jam for the perfect weekend treat. Specifically formulated for people intolerant to gluten. Source of fibre. Gluten, wheat and preservative free. Lactose free (lactose <0.007g/100g). Suitable for vegetarians. Preparation: This product can be eaten straight from the pack without refreshing. Place roll on a piece of kitchen paper and microwave on full power for 10-15 seconds depending on microwave wattage. Remove packaging and bake in a pre-heated oven at 180�C / 160�C Fan / Gas Mark 4 for 3 minutes. For fan assisted ovens, reduce baking time to 1 minute. Refresh Your BreadRolls can also be consumed straight from the pack without refreshing.All cooking appliances vary in performance. These are guidelines only.